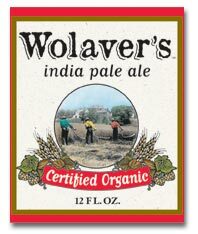 This was our first organic beer, so we didn't know what to expect. Would the hops have a unique characteristic? Well, the answer was yes. We found that this particular IPA had a salty aroma to go along with the flowery hops. We, of course, can't be certain that this is attributable to the organic growing process, but this is the first time we've encountered a salt presence in the aroma. It pours a light amber color with a light, fizzy white head. Heavy carbonation. Initial tastes hits with a light, short blast of bitter, a quick shot of sweet, then a medium bitter at the finish with a long duration. Smooth and dry on the palate, chalky residue left behind. Reviewed on May 13th, 2006 with the Cheney/Duquette clan, MB, and HH.